If you love growing your own fruit and vegies, you will know that part of the fun is trying to work out when they are ready to harvest. It is very difficult to tell if a watermelon is ripe just by looking at it. 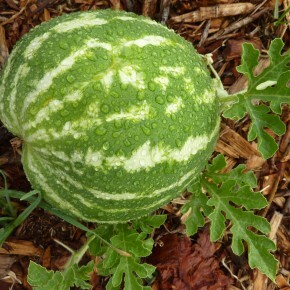 As watermelons will not continue to ripen after picking, it is important to try and harvest them at just the right time. When harvesting a watermelon, make sure that you cut the melon from the vine rather than pulling it. Pulling results in cracking of the stem that can allow pathogens to enter and destroy the fruit. Watermelons do not store for a long period of time so enjoy your fruit as soon as possible!